On Thursday, November 8, the Creative Writing program will host a panel on the MFA, publishing, and other avenues of professionalizing as a creative writer. 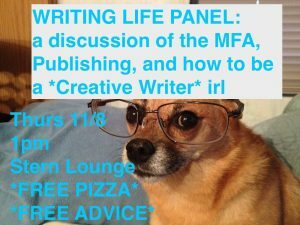 There will be free pizza, with free and honest advice! Speakers include: Darcie Dennigan, Sean Forbes, Brian Sneeden, and Julia Brush. Austin 217 (Stern Room).